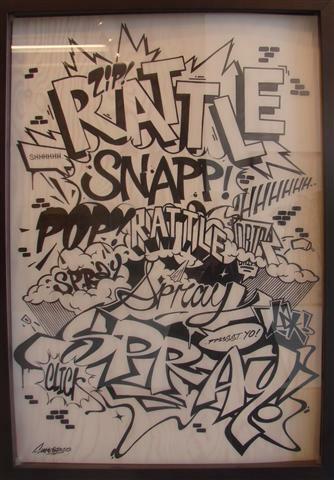 Drawn Festival Vancouver – The Graffiti show. One needs to check one’s assumptions at the door, about graffiti and its place (or not) in Fine Art or High Art. The difference is the “ground” or “support” (canvas, board, paper, or, as in most graffiti, concrete walls, postal boxes, ground level transformers, construction hoardings). Once the graffiti has been removed from its outdoor setting, it becomes something much more gentrified, but the skill levels and messages of the graffiti artists are the same, indoors or out. 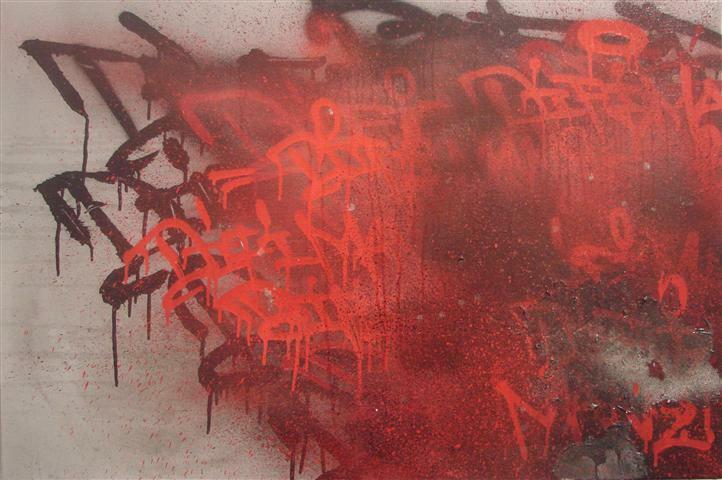 In this exhibition, we are treated to some of the finest graffiti artists that Vancouver has to offer. However, it begs a question. Once the graffiti has moved indoors, does it lose its power? Does it lose its message? Graffiti is born of anger, frustration and even rage, of a generation of younger artists, perhaps unable to find a venue for their ideas and their artistic development; oft-times protesting social ills or just venting. There is daring, in creating the outdoor works, that defies conventional art principles and the bourgeoisie. It’s meant to be somewhat impermanent. Conservation principles do not apply. It’s also the scourge of the police department who continually attempt to suppress this underground movement which so thoughtlessly defaces public and private property. The cost is in millions, per year. It’s interesting to note that, in a perverse way, graffiti has been the germinating factor for a host of traditional mural paintings. Where a mural exists, taggers will rarely paint over. Business are finding that if they have a mural painted on their building, then they no longer have the problem of having to constantly repaint the walls to keep them graffiti-free. Outdoor graffiti embodies the tension and testosterone of youth and rebellion. Bringing the graffiti indoors tames it, turns it into “normal” paintings, though the messages still may represent anger and frustration. It truncates the images by forcing it into traditional squares and rectangles. It prettifies the work for bourgeois consumption. It brings down the chutzpah- quality of the work to a boardroom or living room level. It makes me think that gallery-ifying and taming this art is simply an age-old process of absorbing the dissident, revolutionary and outsider art into the mainstream. By its proliferation, we as a society have become inured to it, habituated, and even, fascinated by it, so much that it is now acceptable, honoured even, by the art establishment. There is nothing wrong with this process. In this way the upstart Realism movement was validated (Delacroix, for example) daring to paint things as they were without prettification and broaching subjects like funerals and revolutions. Impressionism with its upstart take on colour usage and lack of “draughtsmanship” became mainstream, as did the Fauves with their wild, non-representational or symbolic colours. Just as these latter became acceptable, the Abstract Expressionists with their tossing and splashing of paint brought in a new rebellious form, and so it goes. It’s an repetitive process. It’s just the way of the Art world, bringing the young and the highly creative back into the fold, legitimizing their creativity. Those musings aside, it was hard to choose which of the paintings in this exhibition that I liked the best, but I had several reasons for liking the work of the artist Ways, who paints so directly and with so much difficultly. Victim of an accident, he is wheelchair bound and his arm movements are quite limited. Yet with the help of his friends, he manages to practice his graffiti talents on large outdoor walls and also to make studio paintings. 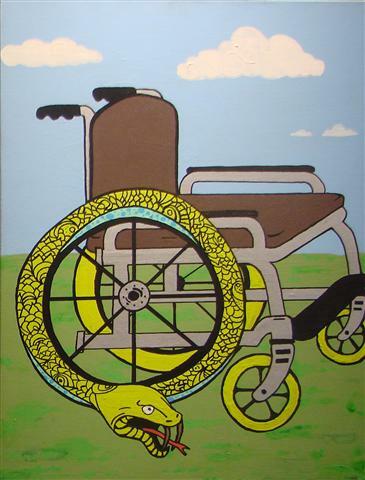 Wheelchair and Snakebite, above are deeply personal because they represent so strongly his own reality. The paintings are carefully executed, amazingly so, and yet there is an interesting texture in the otherwise flat background that keeps it from being too tight. There is a cartoon quality in all of his images shown. While I couldn’t live with the image in these next two of his paintings, I still find Ways’ work original and thought provoking. This is no glib painter. He paints from the soul and I sense a great deal of determination, but also occasional despair with bouts of anguish and anger. I don’t get that same gut-reaction from the other paintings in the show, but there are some other very thoughtful pieces, and then some quite decorative ones. All of them show a maturity of art practice and only a couple tend toward slickness. 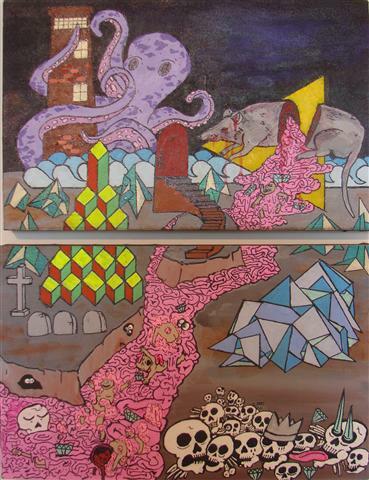 These two paintings are representative of graffiti artist, Difer, a tag name. I am really drawn to the painting Difi Man. I like the richness of overlays in the red, the liberty of mark making, the energy in the imagery, but I can’t explain to myself why the composition works and holds my attention; and I’m not a fan of dribbles in paintings, so it may just be the austerity of the background colour married with the exuberant red that keeps me searching for something more in this work. No access, appeals to my interest in construction, as this “no access” surely refers to some hoarding message saying that no one is allowed on site without meeting all the construction safety site rules. It may be tongue in cheek, because, so often, the mark of a great graffiti artist is not only the work itself but the inaccessibility of the place in which it has been placed. This painting echos the grime and dirt of construction sites and the forbidding nature of the signage. I find it gloomy so the only place it might be appropriate in my home would be on my office door to warn people off disturbing me as I work; but I could see this easily in a museum of contemporary art. It’s not a comfortable piece, but certainly a thought-provoking one. 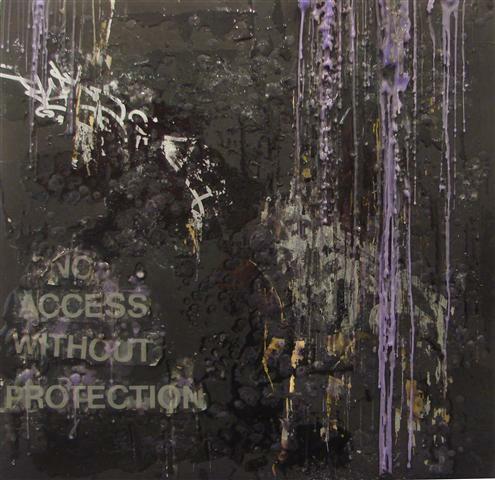 Easer’s painting Bullet Proof is similar to Difer’s No Access in colour range, but there is more formality in the composition. A strong contrast is set up between the rigid patterning of the diamond shapes on the right hand side and the free-form gestures and splatters of the left hand side of the image. They are pulled together by the overlapping row of bullets. Composition is this painting’s strength, and there is an added message, though the significance is up for interpretation. Demos exhibits two very different styles. This one, above, is quite elegant, with fluid forms composed with a thick blue line, and colour fill added in the resulting outlined shapes. There is a mature sense of how colours marry well together and a good feel of rhythm as the enclosed shapes walk you across from left to right. The other style (not illustrated here) results in a formless use of paint , as tangible as a massive cloud seen from its interior, or a London fog, with predominating pastel blues and mauves giving movement to the over all image. Ensoe’s paintings are all cleverly constructed. 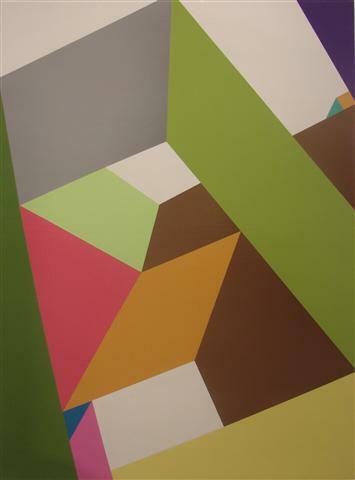 Their geometric figures ambiguously challenge the viewer to determine if the shapes are are going back or coming forward and whether the subject of the work is really about shapes or rather about volumes. Each of his paintings has a different colour combination and yet there is a continuity from one image to another that defining the painter’s overall palette preferences. I like these paintings because they can keep your eye engaged for a long time trying to figure out what is going on. And I like them because they are beautifully finished – the surface is flat, without any variation in tone – a difficult feat to achieve, with clean edges and sharp transitions. Sueme’s Move in Silence is one of two in the exhibition that clearly conform with the exhibition’s title. It uses letters as subject matter in a Pop Art, comic book fashion. It’s one of a few, that actually gives a feel of true graffiti lettering. It has the dynamism, the energy and the flow. The words pop and crackle at the viewer. Obviously, this artist has graphic art training and experience. Each hand drawn letter and word is perfectly formed, even though they change in size, warp and transform in overall shape. This is a dying art, just like type setting and as so much is computer generate, hand lettering has dropped out of the graphic artist’s toolkit. 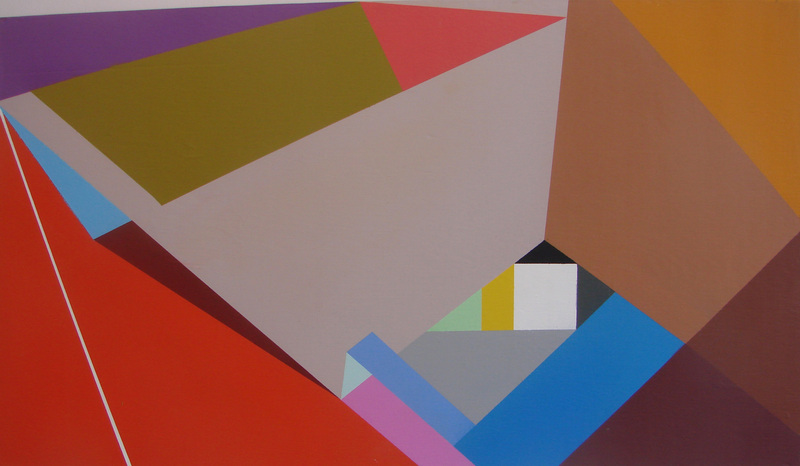 Sueme’s “Conversation Piece” also expresses the Letters theme. 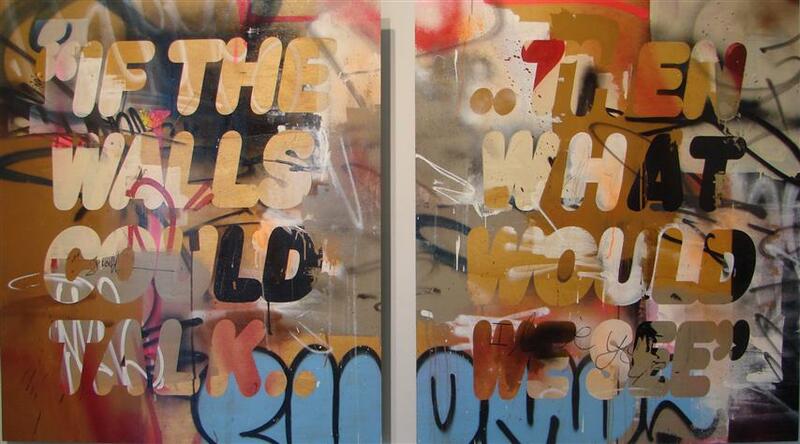 This diptych echos a true graffiti site, with layers of lettering superimposed, apparently randomly. There are at least three “type faces” or “fonts” used in the uppermost layers, representing different graffiti hands at work. But this work is more deliberate than a tagging would be. The top lettering is very carefully formed, with all the letters the same height, and letters shifting in colour from one to the next, even shifting, modulating from light to dark within one letter shape, depending on what the previous layer’s tonal effect provided. The effect? The message on top is bold and clear. It’s a beautiful piece. An uninitiated art appreciator might think this was put together randomly, but a trained artist will recognize the gift represented in this piece, of an artist capable of making something look random, gestural and free while in fact, his years either of work or education (or both) have led to this mature, elegant visual statement. 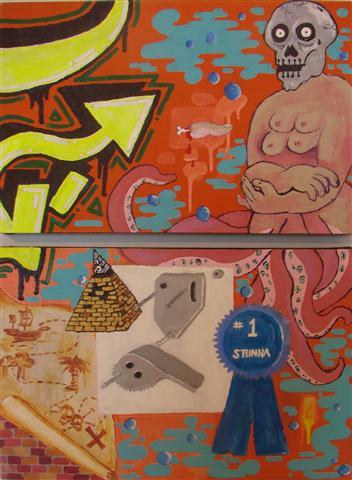 Sueme has a number of other paintings in this show, also artfully ingenuous. Nevermind; Midnight hour; Smooth landing; Play the part. These four panels are a playful use of geometric shapes, jumbling, cascading across the picture plane like a flock of origami figures unbound. The figures are as subtle as Japanese handwork too, with the careful gradations of colour and the highly personal colour combinations. They seem effortlessly together, but I know from my own struggles to get clear crisp lines in paint, that there is a high degree of ability that has orchestrated these shifting colours to be bright, clean and precise. In this show, these are the least like graffiti and letters, but I nevertheless welcome the chance to have seen these fine paintings. So, that’s the gamut of the exhibition. Check out the web-site for the Elliott Louis gallery. As none of these artists are gallery artist, this being an exceptional exhibit provided through the aegis of the Drawn Festival, you will see all the pieces, the prices, the materials used, on the Exhibitions -> Current Exhibition page. The show runs until August 6th, so you still have time to go to see it. The gallery is open Tuesday to Saturday. 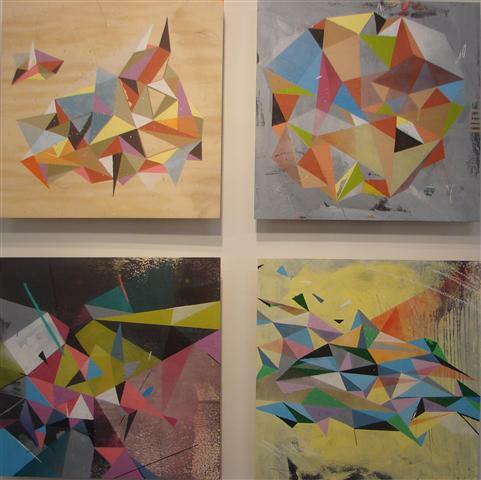 And one last word… if you are looking for something contemporary for your walls, from corporate boardrooms to bedroom walls, there are some affordable pieces in this exhibition. This entry was posted on July 23, 2011 at 4:09 pm and is filed under Uncategorized. You can follow any responses to this entry through the RSS 2.0 feed. You can leave a response, or trackback from your own site.